I’m Rob Tétrault. Welcome to Straight Talk. Today we’re doing trends, crazes and manias. We’re going Dutch! Let’s go back 380 years, 1630s. We’re in the Netherlands. People are buying tulip bulbs. I just bought a tulip bulb. I sold it to someone else. I doubled my money. Fantastic news! I tell my neighbour about it. He’s upset! “How come I’m not making money?” You know what? Just go out there, mortgage your house, borrow some money and buy some more tulip bulbs. He made money. Now, Fredericks made money. Eugene made money. Everyone is making money. The next guy out there says, “I want to get in too.” So how do we do this? Let’s create a market where we can speculate and buy future delivery of tulip bulbs. Well, next thing you know everyone wants to buy tulip bulbs. He’s buying tulip bulbs. He’s buying tulip bulbs. We’re all buying tulip bulbs. Price goes up. Price goes up. Price goes up. Everyone’s in. What happens at the end? There’s nowhere to go but down. Fredericks lost his shirt. I lost my shirt, so did Eugene. We’re all broke. Nothing left. We’re bankrupt. That was the tulip mania of the 1630s. Fast forward 380 years and we’re seeing a lot of the same mistakes made by Eugene, being potentially made by people on this planet. Asset classes such as Bitcoin may very well do well. It’s possible that everyone’s going to start adopting Bitcoin. We’re going to see it being used at Walmart and that Canadian Tire or Tim Hortons. It might happen, but for the valuation that we currently see, we need to have adoption across the board. And I don’t think that’s happened. In fact, I was on the Business News Network as a guest host in December 2017 and I said, “Don’t do this. It will not end well.” And we’ve seen this before. You guys remember the Dot Com bubble? It was crazy time. Everyone’s losing their mind, losing their shirts, buying Dot Com companies that had nothing but a domain name. Stocks were trading at 50, 500, 1000 times their earnings and eventually what happened, my cousin bought some Dot Com stocks. He made a lot of money. My other uncle, he also made money. Buyers, buyers, buyers, buyers. When there’s no more buyers, Eugene lost his shirt in the Dot Com bubble. Eugene, I know you’re out there. I know you’re listening, so I’m going to give you this straight talk. 1. Be wary of emotional, speculative assets such as Bitcoin and other euphoric bubbles. If your cousin told you that he sold a snowmobile and was able to double his money overnight, is that really an asset class you want to have? What I would ask you is, did he tell you about all the losses he had as well? 2. Eugene, if you’re going to invest in speculative asset classes such as Bitcoin, do it responsibly. No more that 5 to 10% of your portfolio. Make sure it’s money you can afford to lose, and please, no leveraging. Don’t go mortgage your house to buy a bitcoin or a tulip. It just makes no sense. You’ve paid that debt down. It does not make sense to speculate like that. 3. Own quality. Here’s what we do at Tetrault Wealth Advisor Group. We take away the mania, the craziness, the euphoric attitude and the emotion out of investing, so you don’t have to panic and stress out about that. At the end of the day, if you own quality, if you own companies with strong balance sheets, good management, good corporate earnings, your assets will grow. And over time you’ll be happy you own quality, because if there is a correction, your assets will be protected and that’s what we believe in. Don’t be a Eugene. Thanks for watching. Winnipeg investment advisor and portfolio manager Rob Tetrault from the Tetrault Wealth Advisory Group, Canaccord Genuity, warns investors about speculative asset classes and how to approach investing on speculation. He compares and highlights similarities between the Dutch Tulip bubble and Bitcoin. Inquire with CSA (Canadian Securities Administrators) and look for registration of the investment advisor or wealth management firm in question. Ask the advisor about his experience in the industry and his credentials (CFP, CIM, MBA, etc.). In order to keep their designation, advisors must adhere and follow the rules from their employer’s ethics policy and are obliged to complete continuing education requirements. Look for an investment advisor from a top reputable wealth advisory group with specific credentials and who is willing and ready to assist you with your objectives and needs in portfolio management. Carefully choose an investment advisor with a pay structure tailored to your needs. An as investor, you have the option to pick an advisor who earns their income via hourly work, a fee based on assets under management or via compensation by means of transaction commission fees. A fee based investment advisor gets compensated by charging a percentage fee on the overall amount of assets under management. This means, a higher amount of savings in someone’s portfolio equals greater pay for the advisor. Keep in mind, the fee charged to clients by the wealth management firm may also lower when the total of assets increases and reaches a target threshold (Eg. Fee of 1.5% for +$500,000 and 1.25% for +1,000,000 in assets under management). Fees may vary depending on the advisor or wealth advisory group chosen to manage your investment portfolio. On the other hand, advisors who are compensated via transactions commissions will collect a commission fee for every executed trade. In addition to having the overall assets under management grow in the client’s portfolio, the latter will benefit from trading securities as he or she receives commissions on the transactions taking place within the client’s portfolio. Before going on the hunt to find an investment advisor or a wealth management group to work with, you will want to determine your financial goals and needs and the compensation method of the securities expert you are willing to team up with. Ask your investment advisor if he/she runs their practice with discretionary or non-discretionary management. What is discretionary management? Certain investment advisors may qualify as portfolio managers able to act on a discretionary basis, subject to certain criteria. If an investment advisor trades securities for his or her clients under a discretionary portfolio management model, the former trades securities as he or she sees fit for their client’s portfolio without the need of the client’s approval. In other words, discretionary portfolio managers will not require your permission to trade equities on the global financial and stock markets. The discretionary model works best when trust has been established in the relationship between the investor and the advisor. Whereas, if you are dealing with an investment advisor under a non-discretionary model, keep in mind that the he or she will need to confirm with their clients before executing a trade. Your approval will be needed before the trade of a security takes place on the financial markets. This is a preferable scenario if the investor wants to be kept in the loop before trades are executed in his or her portfolio. Some investment advisors only work with clients who can meet the minimum target of assets and savings to invest. In your search for a wealth management firm or an independent advisor, focus on looking for a professional who will make time for your concerns, questions and is interested in building a long term relationship. Be aware that some advisors require minimums and you should make sure to do some due diligence to determine if you’re a good fit with the investment management firm or independent advisor you are inquiring about. 5. Marketing, Social Media & Website. How prominent is the brand presence in your area? Do you see the advisor’s brand name in local newspapers, online advertisements, local news, etc.? Is the wealth management firm’s brand mentioned and present on the radio, television and online communities? Be aware that wealth advisory firms do differ in size and service offerings. Marketing budgets are usually correlated with the size of the firm or boutique, but this is not always the case. One could possibly evaluate a wealth management group’s marketing and brand presence in comparison to the size of the financial institution or boutique shop someone is inquiring about. Long-term branding omni-presence is often considered a sign of a successful marketing campaign. Most successful independent advisors and wealth management firms will promote and advertise their professionalism, exceptional customer service, competency and integrity in their respective practice. Does the advisor have a LinkedIn Profile? Maybe a Twitter or Instagram account? Does he or she create and put out content videos on YouTube? Is the website layout clean, sharp and professional? Does the advisor have a financial blog? Online brand presence has never been more important in today’s business marketing plans. More and more folks like you go on-line to read, research and do the research necessary in order to make a smart, educated and calculated decision with respect to whom they choose to work with. Online brand exposure is imperative for achieving success in many other business sectors as much as it is for the top investment advisors and the best wealth management groups in your local area. The trend of searching and gathering online information on business services and offerings has never been more popular worldwide. 6. Community and Charity Involvement. Look for an investment advisor that is passionate about making a difference in their local community. Philanthropists strive to make this world a better place by creating & founding charity programs, volunteering their time to community events and/or donating their hard-earned money to worthy causes. Advisors who have the local residents and their community’s best interests at heart reveals a lot about their respective personality, character and life priorities. Leadership, generosity and empathy are common philanthropist personality traits. They genuinely care for other people’s well-being and aim to make positive changes to their local surrounding area. Most of them strive to give back as much as they can to their community, whether it be via monetary contributions to charities & community events, volunteering their time to help out with community service, sponsoring local sports organizations and much more. By the kindness and generosity of their actions, philanthropists and community engaged advisors will most likely be more trustworthy with your hard earned money in portfolio management. They generally want the best for everyone, especially for their loyal clients. If you know nothing or very little about the wealth management firm’s services, team members, work ethic and track record, no need to worry. Simply search for reviews, testimonials and endorsements online about the firm or the investment advisor you are inquiring about. Yellowpages.com and yelp.com are two of the many online directories that also have a review section for financial services and investment advisors. Endorsements can be found on either the advisor’s website or on social media. LinkedIn has a section dedicated specifically for people to endorse other folks’ abilities by clicking the + sign beside the respective skill and expertise. Evidently, you want to look for numerous positive endorsements on the advisor’s LinkedIn profile page. Many positive reviews usually confirms and testifies the skills & aptitudes of the financial advisory group in question. Don’t hesitate to ask the wealth management team for references, preferably from people you might know locally in your community. If the individuals from the firm are confident in their money management skills and they genuinely want to help others reach their financial goals, they should have no problem giving you a list of references for you to contact. An extensive list of respected references will significantly help build a rapport & mutual trust in what will hopefully be a great and long-lasting relationship with your potential wealth management group. Not all investment advisors can provide the same financial products and services. Investment advisors licensed through IIROC (Investment Industry Regulatory Organization of Canada) may have different investment products than a mutual fund dealer licensed through MFDA (Mutual Fund Dealers Association) and vice versa. Clients can invest in several financial instruments in many different investment savings vehicles. Look for products that would fit your needs and financial objectives. The use of specific products and accounts utilized by institutional clients, charitable organizations, non-profit entities, foundations, trusts, corporations, businesses, families and individuals will vary from their respective investment portfolios. Beware that not all investment advisors have the same service offering. Simplify your life and save yourself some precious time by working with a wealth management firm that offers more than one service. The most proficient advisors usually offer a one stop shop for a wide range of services included in their practice. Some of the services offered are: tax planning, insurance planning, estate and retirement planning in addition to investment portfolio management. The extra service offerings mentioned above are usually included with the remuneration paid to the fee-based investment advisor for managing your assets. There are several advantages of having one firm look after all your needs. A client would be better off having the same professional advisor look after all their planning needs since the relationship has already been established and the advisor is already aware of the client’s personal constraints, objectives and financial goals. 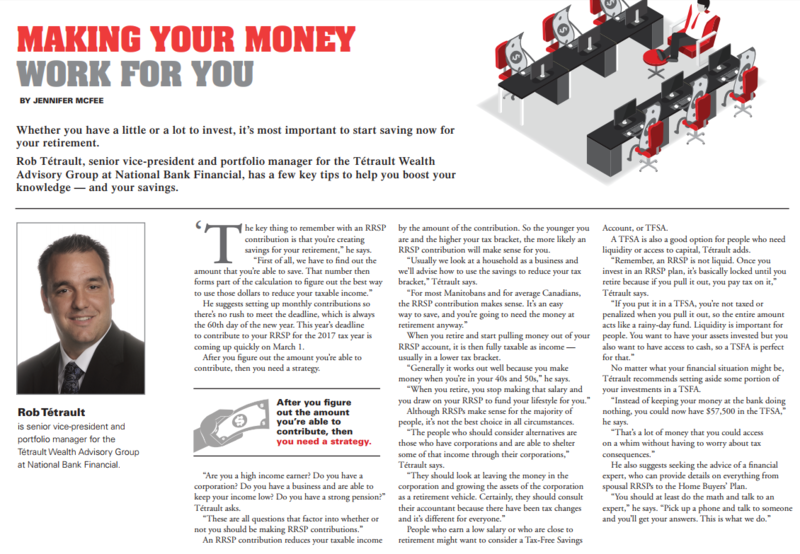 Rob, Portfolio Manager of National Bank Financial Wealth Management gives advice on Taxes & RRSPs in the Winnipeg Free Press. Image is republished from the Winnipeg Free Press Taxes & RRSPs publication.